Welcome to Chessvis.com. While the website is designed for exploration without prior instruction, you will find that this document gives you an idea of what visualization exercises exist and how to use them. At present the website consists of three distinct visualization approaches. Static Boards - Look at a board, memorize it and rebuild it relying only on the image in your mind. Move Following - All exercises involve being given a board and a set of moves. 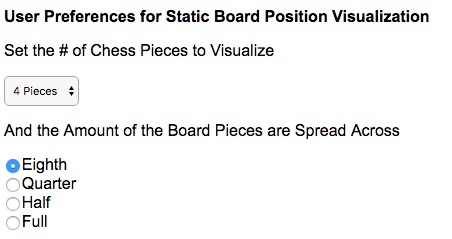 You need to visualize the effect of those moves on the board position. (And in the case of "Who's Guarding Whom", how the movements impact the relationships of those pieces to each other. 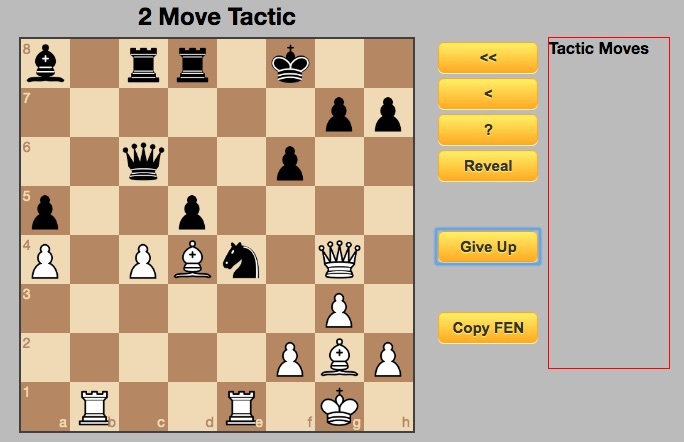 Tactics & Mates - Solve 1 to 3 move tactics and 1 to 4 move mates interactively. 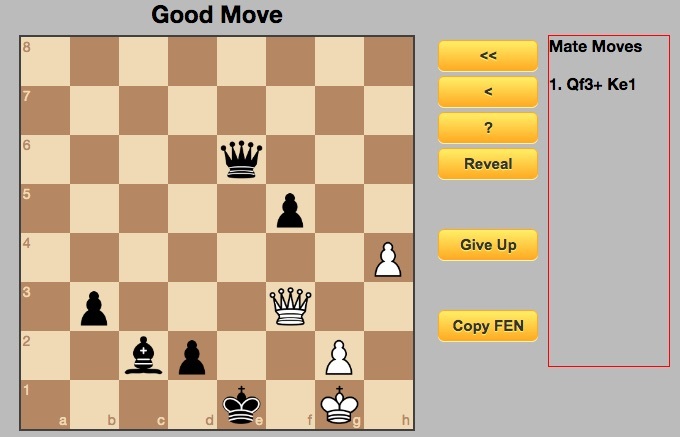 With the "Back it up" exercise, you solve the same tactics and mates but the board position you see on the screen is from some number of moves before the tactic or mate sequence starts. You're told the moves and then need to solve the tactic or mate in your mind. It is said that looking at the board while trying to work out a move sequence is more of a hinderance than a help. That the board hides the ranks, files and diagonals that get opened up and closed down by piece movements. If you can hold the board in your head then it is easy to shift the pieces around and visualize the new board just as easily as the current board. Memorizing a board layout isn't easy (at least to me). There are options to limit the number of pieces and how much of the board they occupy. In this example, there will only be 4 pieces on the board and they will occupy only an eighth of the board space. A static board will be shown using the number of pieces and area of the board you specified in the options. Drag and drop the piece inventory on the side of the board to replicate the board that was there before. When you are done, click "Check It" and the website will check your work against the original. Here I placed the white queen in the wrong place and that error was highlighted. Your attempt on the right and the correct answer on the left. Differences are highlighed in red. The website can test your memorization skill automatically. First phase is to determine how many pieces you can memorize. It will start with 16 pieces and then go up or down depending on how well you do. Once you are 100% successful on a set of pieces, it will repeat that for up to 5 times to determine an average. If you get them all right it will check the number level up and if you miss some it will check the next level down. For Move Set, Entire Game and Specific Pieces, you will be shown a board position and then a set of moves. After the moves, you will be asked to update the board to reflect how the board will look at that new point. These options allow you to control the difficulty. Set the # of Chess Pieces... - this option is used for the Move Set exercise. Chessvis will find a game position that has this number of pieces in it for you to track. 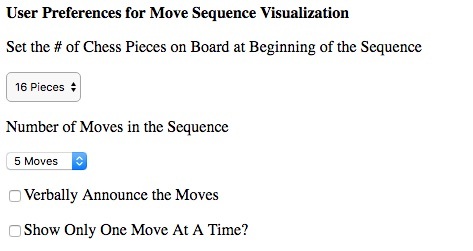 Number of Moves in the Sequence - How many moves are shown before you are asked to update the board. (This is the number of white & black move pairs.) The fewer moves in the sequence, the easier the task. Verbally Announce the Moves - If checked, the moves will be verbally announced. For example, a woman's voice will say: Bishop takes E 6", in addition to displaying the move on the screen. The idea here is that you might find that your mind likes to receive information audibly and is able to maintain the board image more easily this way. Show Only One Move at a Time - By default, all the moves for the sequence will be displayed at once on the screen. This option will cause the exercise to only display one move at a time and then that text will no longer be available for you to see and refer to. This exercise is designed for you to work on playing a set of given moves in your mind. After the specific number of moves is made, your task will be updating the board to reflect the moves that have been made. 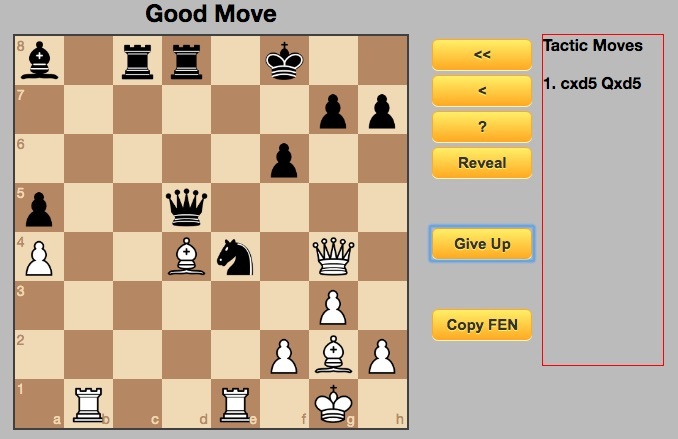 Here is a typical example when the options are set to: 8 pieces, 3 moves and show all moves at once. This position and the moves were retrieved from a real game. The concept behind this exercise is the same as in Move Set except here we start at the beginning of a game. After every specified number of moves, you will update the board and then can continue through the entire game if you so desire. 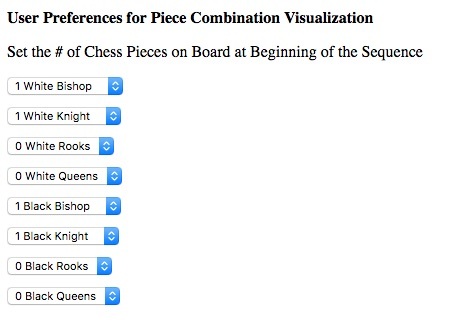 If you want to focus on the movements of specific pieces, use this screen to indicate the piece combination and use the next screen (Specific Pieces) to follow the move sequence involving those pieces. The only limitations are that there have to be at least two pieces of each color and at most 8 pieces of any given color. In other words, if you wanted to focus on knight movements, you could have 4 knights of each color or even 8! 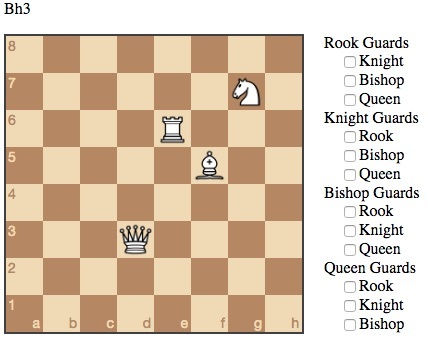 In the above example, a white knight, white bishop, black knight and black bishop will be randomly moved. A board and random piece movements will follow the piece counts given on the Options screen. Your interaction with the screen is the same as with the previous example given for Move Set. One thing to note is that for each unique combination of pieces, multiple long games are created for those pieces. If the combination hasn't been created before then there will be a slight delay while those games are created. This is mentioned on the screen before your first board is displayed. In Andrew Soltis' Book, Studying Chess Made Easy, he references an exercise cited by the Russian educator Alexey Bartashnikov in 64 magazine. Dan Heisman also mentions this exercise in his Novice Nook column on Improving Visualization. Then your task is identifying which pieces are "guarding" another piece. 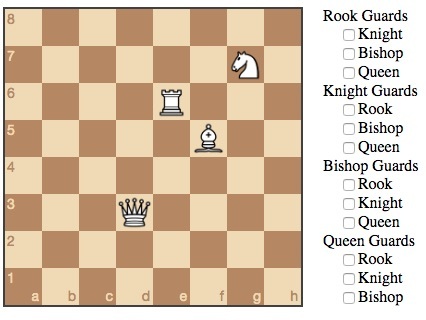 For example, in the above board the knight is "guarding" both the rook and the bishop. 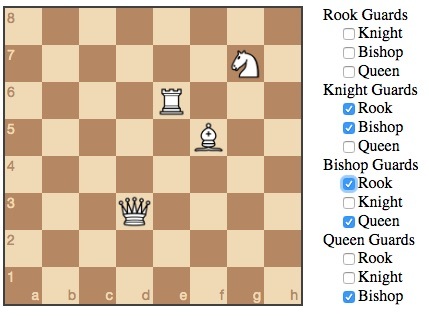 Identify all the guarding using the set of checkboxes to the right of the board. For this board, here is how the checkbox array should look. and Chessvis will verify your work. In this case, there are no errors. Now the fun begins, clicking the button will show you the first move you need to track solely in your mind. 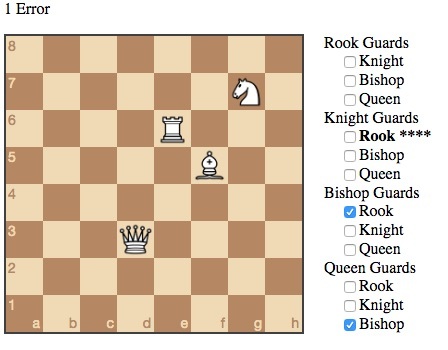 The Bishop moves to "h3" and that changes the dynamic of who is guarding whom. See the Bishop on h3 in your mind and see how it is interacts with the other pieces. Check the boxes accordingly. Here, a guarding is purposely missed and the system highlights the error. Now it is time for move 2 which builds on move 1. There is no limit on how many sequential moves you can try. When you're done, click "Done" and you'll be told the number of total errors and time spent. 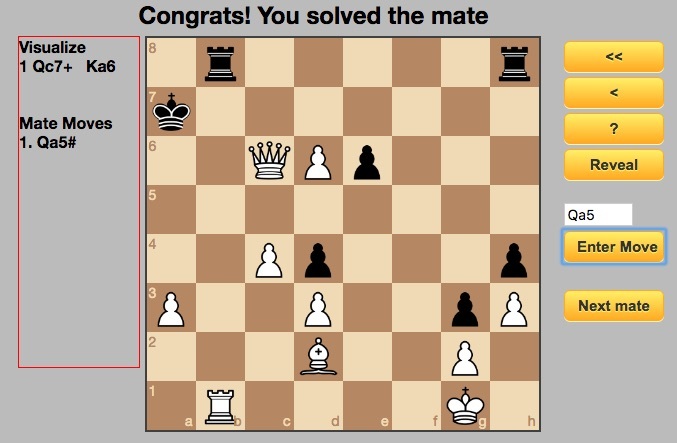 Welcome to the tactic and mate puzzle solving exercises. 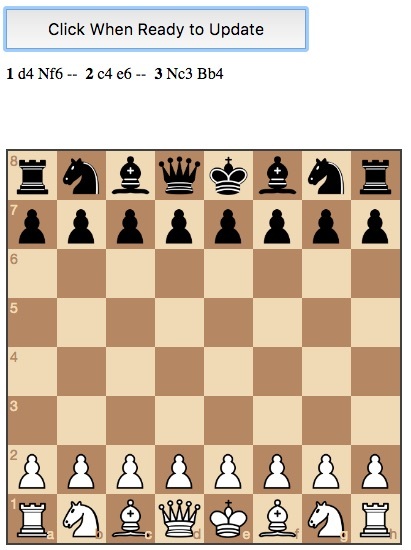 You can interactively solve 1 to 3 move tactics and 1 to 4 move mate sequences. 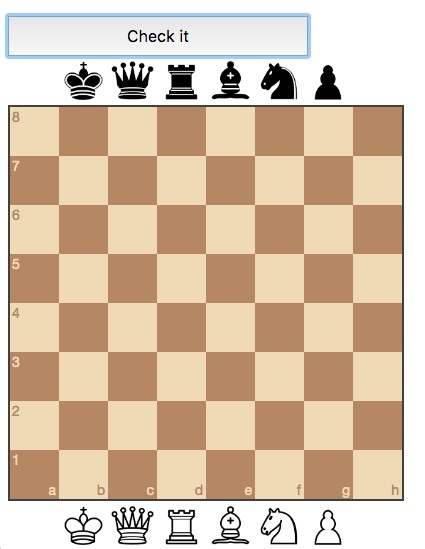 "With the "Back it up" exercise, you solve the same tactics and mates but the board position you see on the screen is from some number of moves before the mate sequence starts. You&apos;re told the moves but need to visualize them before solving the tactic or mate in your mind. 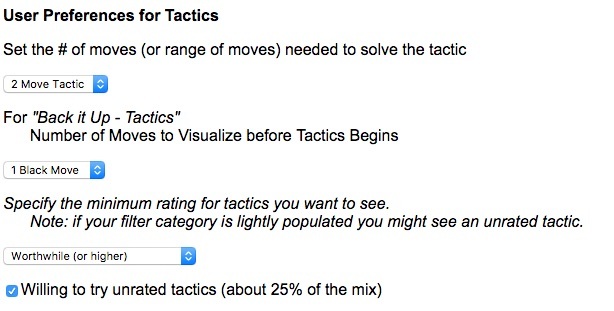 tactics - Interactively solve 1 to 3 move tactics. Back It Up - tactics - The same set of tactics is used but the board position you see on the screen is from some number of moves before the tactic sequence starts. You are told the "backed up" moves and will need to visualize them in your mind before solving the tactic. Mates - Interactively solve 1 to 4 move mates. Back It Up - Mates - The same set of mates is used but the board position you see on the screen is from some number of moves before the mate sequence starts. You are told the "backed up" moves and will need to visualize them in your mind before solving the mate. 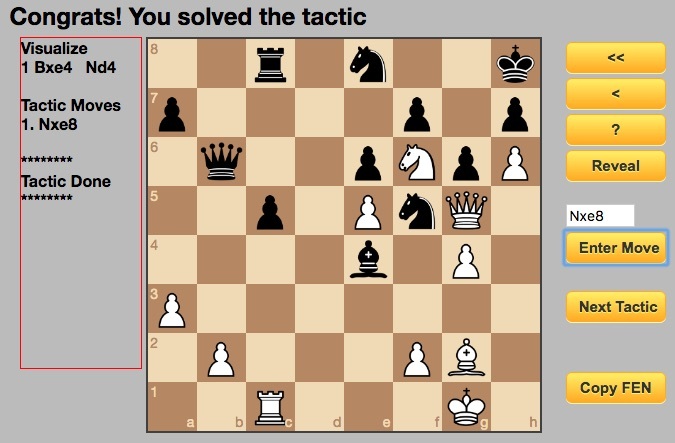 This exercise enables you work on your tactic solving ability. 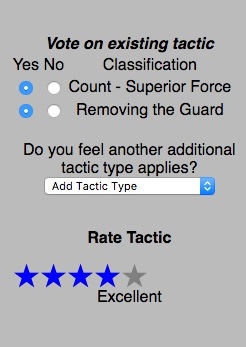 After clicking on "Get Tactic", you will be shown a board meeting the criteria specified on the "Tactic Options" page. You directly manipulate the pieces on the board to solve the tactic problem. For example, if you feel the first move of the sequence is that the pawn on "c4" needs to take the pawn on "d5" then click on the pawn and drag it to that square. Since that is a good first move in the sequence, the move will be noted on the right side and black will make a move and the board will be ready for your next move. Copy FEN -- Copy the board description to the clipboard. Sometimes, the reason a tactic works is mysterious and the best way to clarify the reason is to bring the board layout into an analysis program that has a "Paste FEN" option. "Stockfish" is an excellent free program for this purpose. FYI, FEN is used by computer programs to describe the position of the pieces on the board. 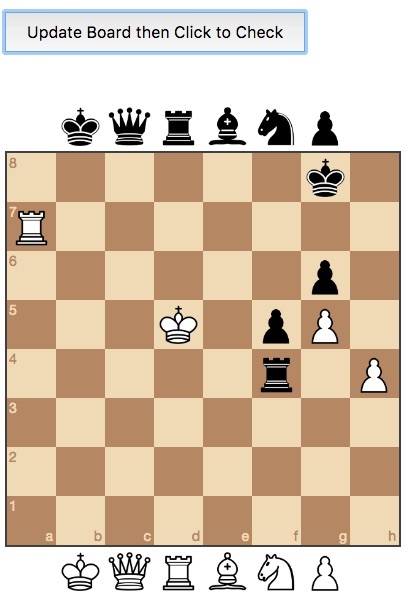 In this example, I felt the black pawn was guarding the knight and the first move "removed the guard". Then the knight can be won because of superior force on that square. I also felt this was an excellent representation of these tactical motifs and that other users would benefit from seeing it. If others have voted on the tactic, you will see all the motifs picked and you can either agree (yes) or disagree (no). A description of the tactical motifs can be found at the end of this document. 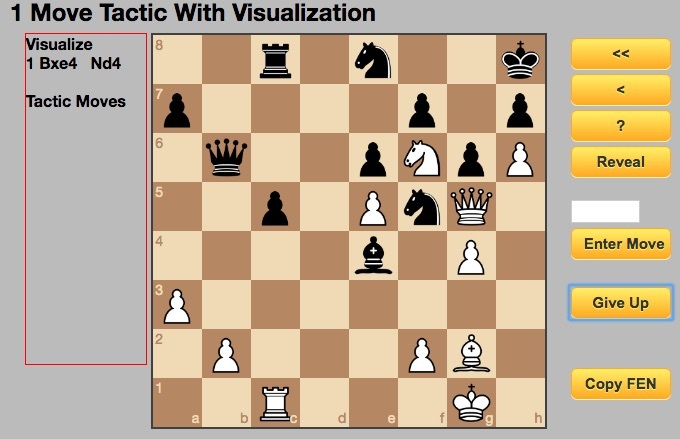 The moves you need to visualize before you can solve the tactic are given on the left side. 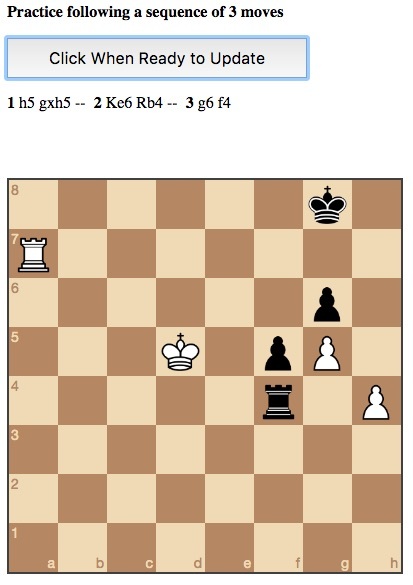 In this example, the 1 move tactic is preceeded by white moving the bishop and capture what was on "e4" and black responding by moving their knight to "d4". Visualize those moves and determine the right next move for white. Since the board is not like what you need it to be to directly manipulate the pieces, you will have to enter the move text in the box and click "Enter Move". As with the regular tactics puzzles, the buttons do the same thing. 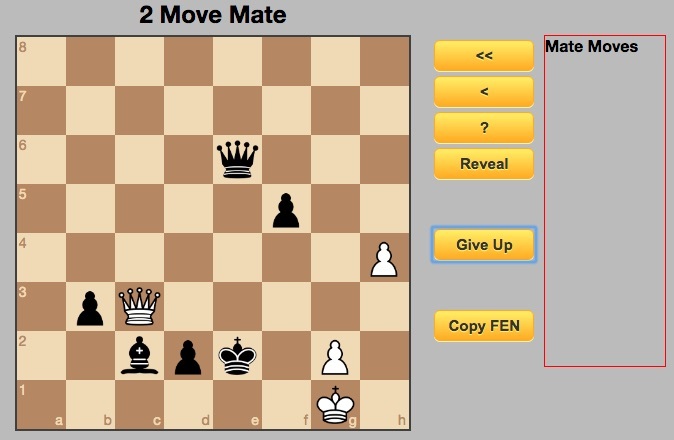 The "Reveal" button will show both the visualized moves and the mate sequence moves. Also, if you have logged-in, you will have an opportunity to rate and assign tacitcal motifs. This exercise enables you work on your mate solving ability. 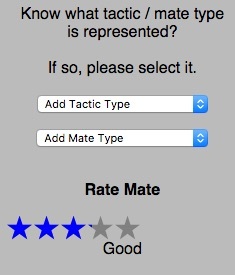 After clicking on "Get Mate", you will be shown a board where there is a mate sequence for white. You directly manipulate the pieces on the board to solve the mate. 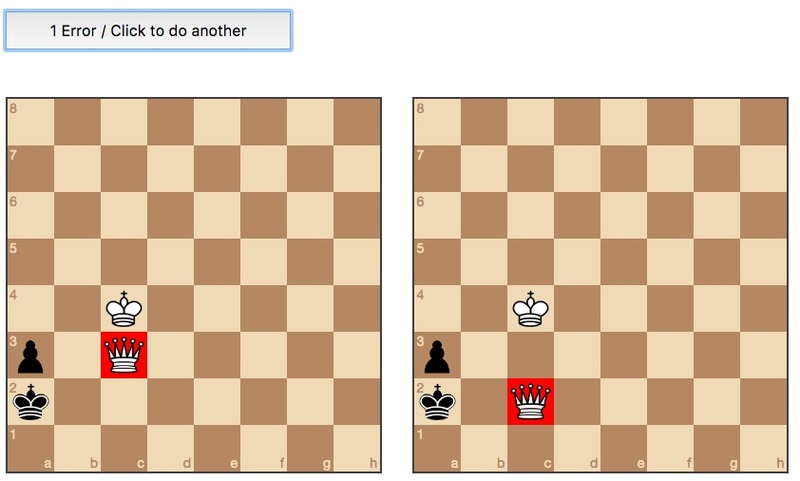 For example, if you feel the first move of the sequence is that the queen needs to go to "f3" then click on the queen and drag it to that square. Since that is a good first move in the sequence, the move will be noted on the right side and black will made a move. The board will be ready for your next move. Now the board is ready for your second move. As before, if you feel the queen should move to the "f1" square, pick it up and move it. 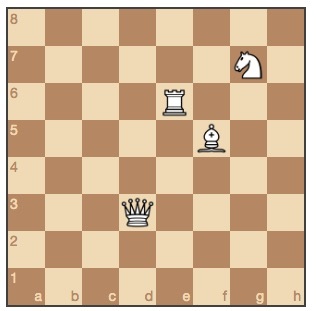 Since this is the right second move in a two move mate sequence, you have now solved the mate successfully. Copy FEN -- Copy the board description to the clipboard. Sometimes, the reason a mate works is mysterious and the best way to clearify the reason is to bring the board layout into an analysis program that has a "Paste FEN" option. "Stockfish" is an excellent free program for this purpose. FYI, FEN is used by computer programs to describe the position of the pieces on the board. In this example, I didn't feel it met any tactical motif. I also didn't know a mate type that fit. I didn't select either. But I did feel it was a good 2 move mate so I rated it accordingly. If others have voted on the tactic and/or mate, you will see all the motifs picked and you can either agree (yes) or disagree (no). 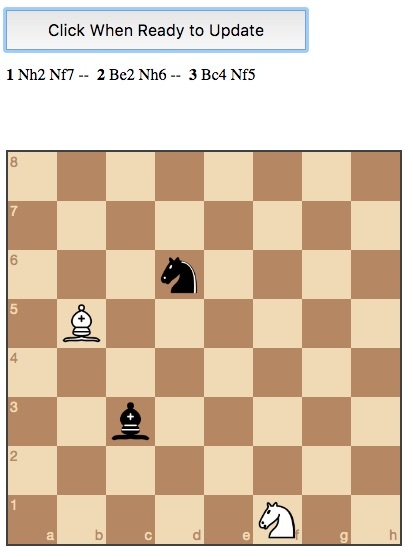 The moves you need to visualize before you can solve the mate are given on the left side. 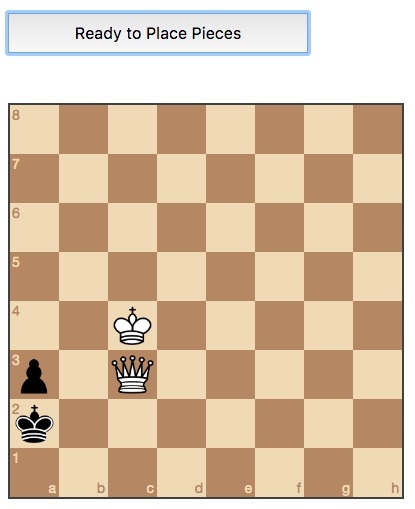 In this example, the 1 move mate is preceeded by white moving the queen to "c7" and black responding by moving their king to "a6". Visualize those moves and determine the right next move for white. Since the board is not like what you need it to be to directly manipulate the pieces, you will have to enter the move text in the box and click "Enter Move". Did you come up with "Qa5" as the right next move? As with the regular mate puzzles, the buttons do the same thing. 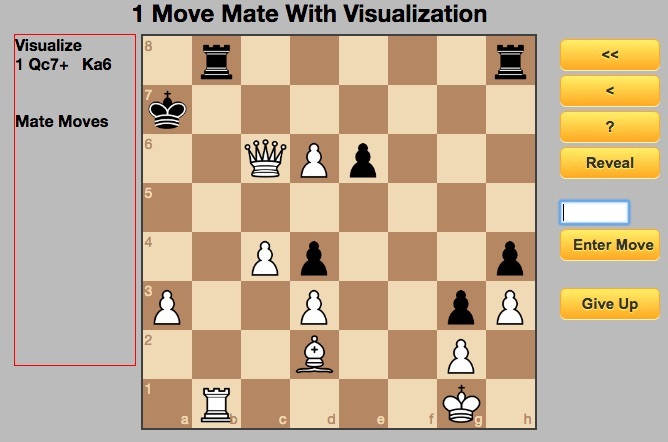 The "Reveal" button will show both the visualized moves and the mate sequence moves. Copyright 2017 - Conceptual Software, Inc.